Everyday computing just got easier with the Dell Latitude 11 5000 Series 5175 2-in-1 Notebook PC. Enjoy true reliability on the road or at home with a simple, yet powerful value-packed Notebook that gets the job done. Fully loaded with an Intel Core m2-6Y30 2.2GHz Processor and 4GB DDR3 Memory, the Dell Latitude 11 5000 Series 5175 2-in-1 Notebook PC makes for a speedy and efficient PC. The 128GB SSD provides ample space to store all crucial data safely. The 10.8" FHD Touch Display provides for crystal clear viewing. 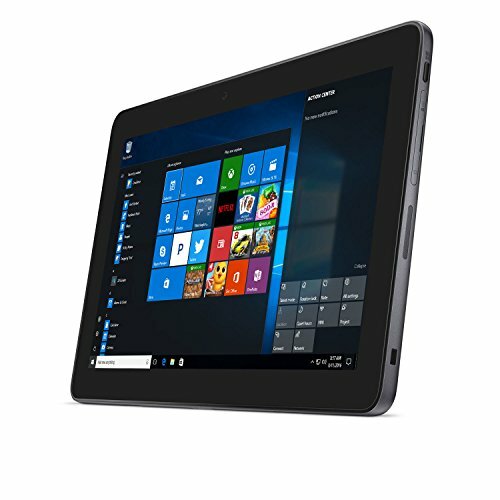 The Dell Latitude 11 5000 Series 5175 2-in-1 Notebook PC is also pre-loaded with Windows 10 Home that offers a user-friendly interface. The flexibility of two.The manageability of one. Tablet to laptop and back again: Effortlessly convert your tablet with the optional Latitude 11 Keyboard or Latitude 11 Slim Keyboard to instantly gain full laptop productivity and extended battery life. Well-built beauty: Every Latitude 11 is constructed with premium materials, including magnesium alloy, and is finished off with soft-touch paint. It's made with Corning® Concore Glass, providing 5x better surface damage resistance for thinner devices and greater durability than traditional displays. Interact with Clarity: Enjoy stunning resolution with the 10.8" UltrasharpTM FHD display, optimized for intuitive touch interaction. Freedom to roam: Built-in wireless technology with the latest long-range 802.11 ac wireless technology makes it easy to surf, stream and stay connected, while the long battery life allows up to 8 hours of unplugged power.